What’s the least thing you like about owning a cat? If you said “cleaning the kitty litter box” then you’re in good company! But just because your cat’s litter box sits delicately concealed in your home somewhere doesn’t mean you should neglect it. On the contrary, keeping a clean and tidy kitty litter box is important not only for your cat’s health, but for the health of everyone else in your home, too. Plus, a clean box helps you avoid the unpleasant and awkward issue of foul odors emanating from your cat’s, eh, indoor potty. Sounds like something from the future? Scratch that: the future is here. An automatic cat box saves time. An electric litter box is good for hygiene. Using an automatic kitty litter box is a great way to pamper your furry friend! 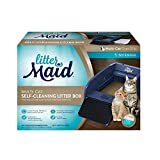 What type of litter should I pick for an automatic litter box? Where should I place my automatic cat litter box in my home? How do I help my cat get used to her new fancy toilet? How do I teach my new kitten to use an automatic litter box? This self cleaning litter box sifts and deposits your kitty’s waste into a drawer after every use. It’s an ideal option for multiple cats and suitable for felines of all sizes (5 lbs and up). The Litter-Robot III Open Air comes with a notification system to alert you when the waste drawer is nearly full, and in the meantime controls unpleasant odors. The product looks adorably futuristic and affords your feline the privacy she needs to do her duties. Some users note its large size makes it tough to fit into smaller homes, and the open door design can cause litter to be accidentally kicked out, the latter of which can be prevented by purchasing a fence or ramp accessory. Feline friends make great pets for busy homeowners. Why? These animals are highly independent and can handle being on their own for extended periods of time—most of them, anyway. With auto litter boxes, you’ll deal with way less hassle and mess, which can save you valuable time every week. It’s like a “set it and forget it” way to keep you and your feline friend happy. Having a box that cleans itself can help keep your cat cleaner, too. No more “Oh shoot” moments when you realize you forgot to empty out the cat’s litter box again! Electric litter boxes don’t rely on your memory to work. Available models are easy to set up, simple for your cat to use, and very effective. They remove waste, eliminate odors, and prevents your kitty from spreading germs and gook around the house on her paws. Plus, you won’t have to worry about handling her feces and urine, either, which is a huge plus for your own personal hygiene. Many pet parents have resorted to teaching their feline friends how to use the actual toilet. But this can be a pretty frightening for most cats—and a frustrating process for most pet parents! A worthwhile reminder: aside from the obvious challenges of “potty training” your kitty, felines also have a natural instinct to bury their waste. “Forcing” your cat to use the potty can actually deprive her of this inherent act. If you think your furry friend will have a hard time adjusting to a new box, you don’t have to write off an auto box as an option yet. The best products which come with auto-cleaning capabilities are cozy and comfortable for your kitty. With time, she may very well love her new potty! Admit it: your pampered kitty acts like a cute little queen. Doesn’t she deserve a clean and luxurious “throne”? Let her relieve herself as nature intended in a private, stylish, state-of-the-art console that will fit subtly into your decor. When it comes to pet chores, how important is convenience? Understandably, a self scooping litter box tends to be a little pricier compared to traditional models. But many users agree that the amount of hassle and, well, yuckiness, that can be avoided with a self-cleaning cat box is far worth the investment. Do you frequently forget to change your cat’s litter box, or dread the task so much that you put it off until the last minute? Take your own will power out of the equation. Using a box that does the hard lifting for you relieves you of your least favorite chore! How many pets do you have? If you live in a multi-cat home, a box that cleans itself can save you a ton of time! This is because you won’t have to change out the litter as frequently. Even if you only have one feline friend roaming about, you can still expect to spend a fraction of the time on minding her litter box compared to what you would spend using a standard box. Are you comfortable troubleshooting an electronic device? Automatic boxes come with directions and the best ones are easy to set up and use. But if you’re a bit of a technophobe, you’ll want to make sure you’re ready to handle a new automatic device in your home. So, what is the best litter box for cats? We’ve looked around to find 7 of the top-selling brands around. Which one is best for your cute companion? The Litter-Robot III Open Air model is considered by many to be the best cat litter box that is 100% self-scooping. The manufacturing company offers a 90-day money back guarantee, plus a warranty for 18 months. Requires less litter—expect to use as little as 50% of what you normally would need! There’s even a handy night light if nature ever calls when it’s dark out! The Robot III Open Air is one of the priciest models available. But, like most things, you get what you pay for! It’s reliable and durable, which means you’re less likely to run into maintenance issues. And remember, it comes with a warranty and a money back guarantee. 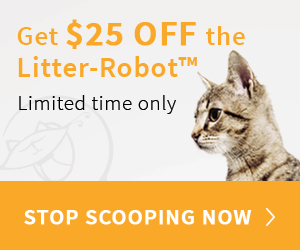 The Litter-Robot III Open Air is the best automatic cat litter box for felines weighing at least 5 lbs and up to 20 lbs. If you’re someone who needs or wants to avoid cleaning out a litter box as much as possible for whatever reason (convenience, time constraints, medical conditions, etc. ), then this may be a great choice for you. Let your cat relieve herself and satisfy her covering instincts with these washable and reusable granules instead of normal throw-away litter. This thing looks and works just like a little feline toilet! The CatGenie is great for people who care about hygiene and who would like as little involvement in their cat’s litter box as possible. If you have a spare bathroom or some other space with cold water access and an outlet, it’ll work great for you. You’ll just need to be aware that clogs in the drainage system can happen, a potential problem that will need attention. Fortunately, you can mitigate this problem by regularly grooming and brushing your kitty. This model uses a highly absorptive crystal litter that dries out solid waste and absorbs urine to avoid leaks. A rake cleans out the disposable tray thanks to an automatic timer (which has 3 settings to choose from), and dumps the waste right into a closed compartment. You can even use it to monitor your cat’s digestive health since it keeps track of how many times she uses the box! So, if you’re willing and able to buy the disposable crystal trays that go with the unit, and are looking for ideal waste odor control, this model could be the right choice for you. Expect to change out the crystal tray about every 10-20 days if you live in a single-kitty home (it may not be feasible if you have many felines). Do you have tons of kitties roaming around your home? The Littermaid LM980 Mega is a great option. As its name implies, it can hold up to 50% more kitty litter compared to other brands. Are you not afraid of a little maintenance on your kitty’s box? If you’re not looking to completely eliminate your scooping duties but are simply hoping to do them less often, the Littermaid LM980 could be your next purrrrfect purchase. Where bathroom meets high tech! The SmartScoop Intelligent from OurPets offers a 2-year warranty. If you’re looking to go from a litter box cleaning routine of every day or two to every 4 to 6 days, and if you’re into high tech gadgets that can help you “hack” your kitty’s health, this auto cat box may be just what you’ve been looking for. Just be prepared to scrape urine clamps from the bottom of the tray, since the rake may miss the smaller clumps. Unlike competing brands, the PetSafe device runs continuously thanks to a rotating litter bowl. This maximizes its hygienic benefits. While compact and hygienic, this device does need a bit of daily love and maintenance. Otherwise, it may be a great option for you and your small and healthy kitty. Rounding up our list is this super affordable and easy-to-use auto-cleaning litter box from Omega Paw. 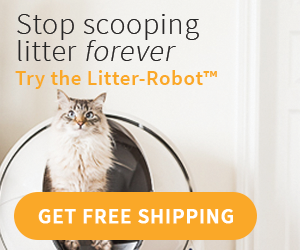 No, it’s not truly “automatic,” since it does require manual action from you—but you still don’t have to come in direct contact with dirty kitty litter on a daily basis! So, for the pet owners who are looking for a super affordable, effective, and easy-to-use litter box that removes the need to frequently come in contact with dirty kitty litter, the Omega Paw Self-Cleaning Box may have a great place in your home. If your kitty is on the larger size, you may also want to look into this option, since she’ll definitely have ample room inside! You love your kitty. She’s an important part of the family, and as such, she deserves all the proper care and attention she needs to be healthy and happy. But let’s be honest: cleaning out the kitty litter day in and day out can be a real drag! Besides, sometimes life gets in the way. Maybe you get caught up at the office and come home late from work one day. Perhaps you’re traveling out of town and don’t want to bother your neighbor or house sitter with kitty litter duties. Maybe you’ve got a bunch of furry friends in your house, and the amount of cleaning, scooping, and tossing is driving you a little nuts! You may even be struggling with a medical condition, and the thought of having to handle, touch, and clean the toilet of your feline every day just seems like far too much work. 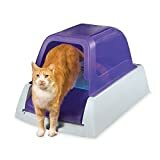 No matter what reason you have for wanting to cut down on your time managing your feline’s indoor potty, an auto cat box can be the answer to all your needs! 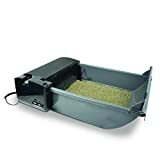 Generally, automatic cat litter boxes (aka self-cleaning ones) have a receptacle beneath or at one end of the box itself. A mechanical rake moves through the litter and sifts out your kitty’s waste products, depositing it into the receptacle. Odors are contained in the receptacle until you empty the receptacle by some sort of enclosure or top. Read the directions on your device, as it should specify what type of litter you’ll need to use (e.g., clumping, crystals, non-tracking, etc.). Using the incorrect one may impair the function of the self-cleaning box. The ideal place is in a low-traffic, low-noise area where your cat regularly goes. It should be on a hard and sturdy surface and easy for your cat to access in multiple ways. 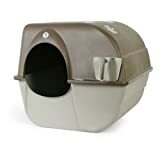 You can get your animal used to her new high-tech litter box by placing a small amount of her waste from her old box inside the new one, in order to “familiarize” it. You may need to leave the automatic litter box powered off for the first couple days until she’s using it on her own. When you do turn it on, simply watch to see how she reacts to the noise of the mechanism. This may also take her a little time to get used to. Expect to start teaching your kitten how to use a litter box around 1 month old. In some cases, she may even come to you already trained by her mother! You’ll need to show your kitty where the “toilet” is, and may need to follow the similar steps for re-training an older cat how to use a new box. Cats and kittens are more comfortable using litter boxes when they have privacy hoods, are easily accessible, and in an area of the home where no one can sneak up on them and surprise them while they’re doing their business. If you’ve been looking for an easier and quicker way to maintain your kitty’s box, then we recommend reading through these self cleaning litter box reviews to determine which one of the many options available may be the best fit for you and your feline companion. Also, make sure you remember the points from this infographic. Click for bigger picture.